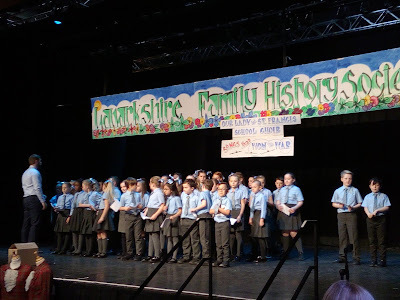 Yesterday I attended the Lanarkshire Local and Family History Fair (https://lfhsshow.weebly.com), which for me is always the highlight of the genealogy year in Scotland. 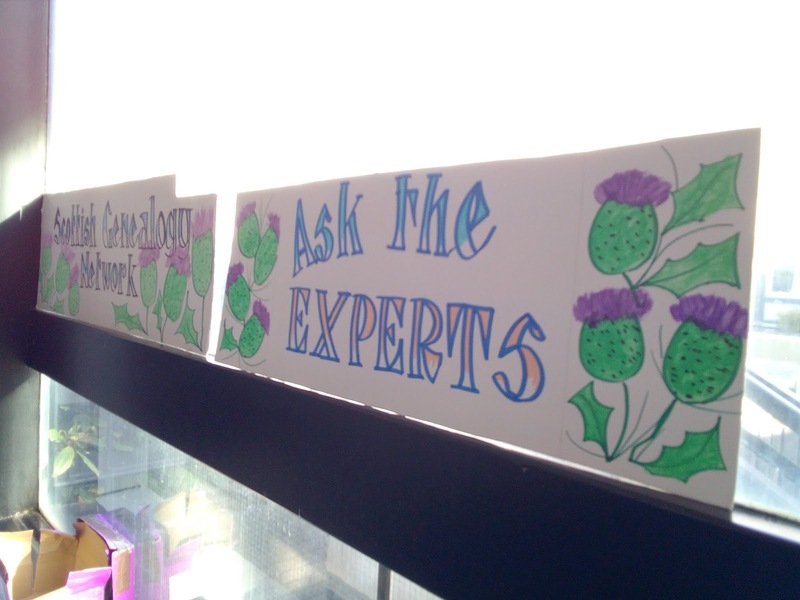 In addition to helping out on the Scottish Genealogy Network's Ask the Experts stall - where I answered many Irish questions in particular! 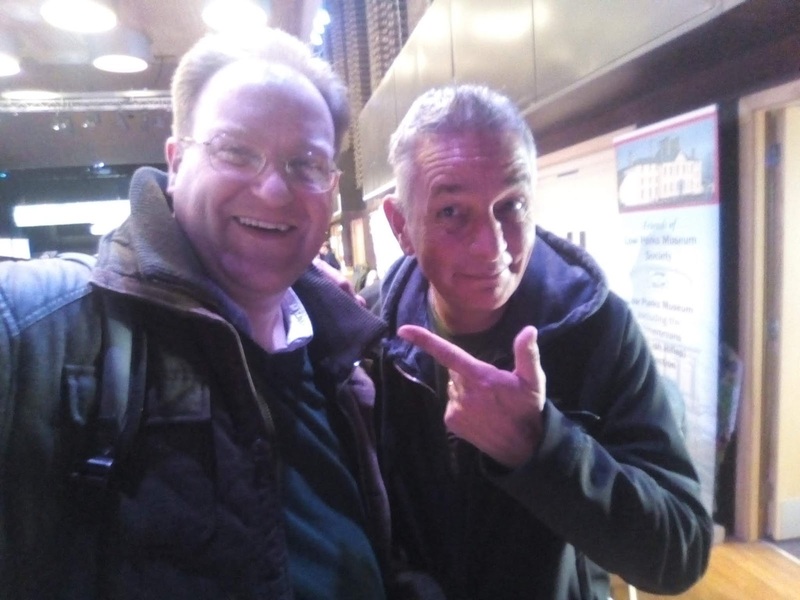 - I also had a chance to catch up with a few friends and to learn of some new developments. 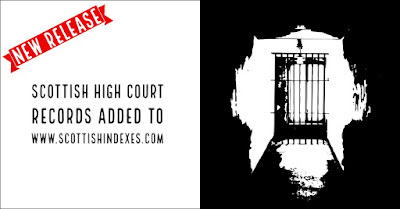 The big announcement at this year's show was the launch of the Scottish High Court records by Emma and Graham Maxwell of Scottish Indexes (www.scottishindexes.com), announced on this blog yesterday - see https://britishgenes.blogspot.com/2018/10/scotish-high-court-records-added-to.html - and which certainly kept the couple busy throughout the day! 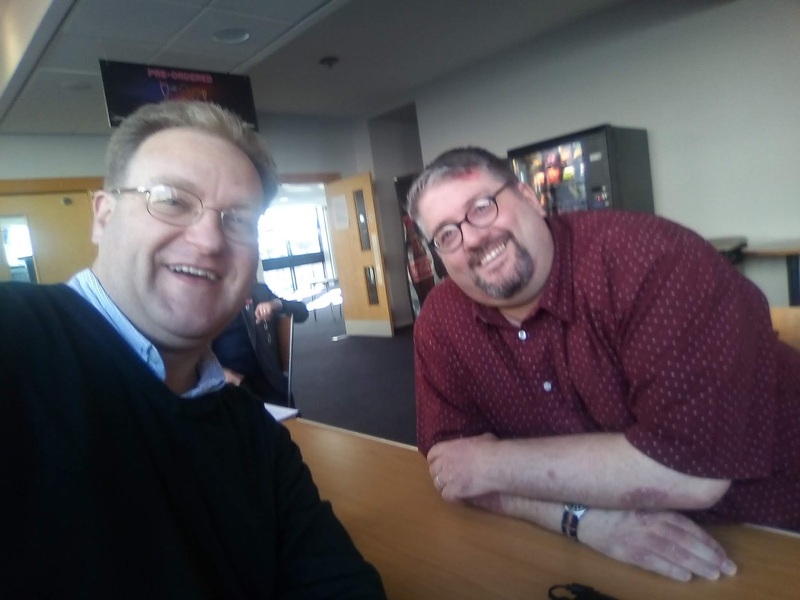 I also managed to catch up with David McNay from the Scottish Military Research Group (http://www.scottishmilitaryresearch.co.uk), who informed me that there were several things in the works on the First World War anniversary front - not least the Lloyds Banking Group intending to put a roll of honour online shortly. Helen Grant from Scottish Monumental Inscriptions (https://scottish-monumental-inscriptions.com) updated me on new releases, including records from Balmaclellan, Carsphairn, Deans Cemetery, Drongan, Kells, Machermore, Parton, Patna and Wigtown. 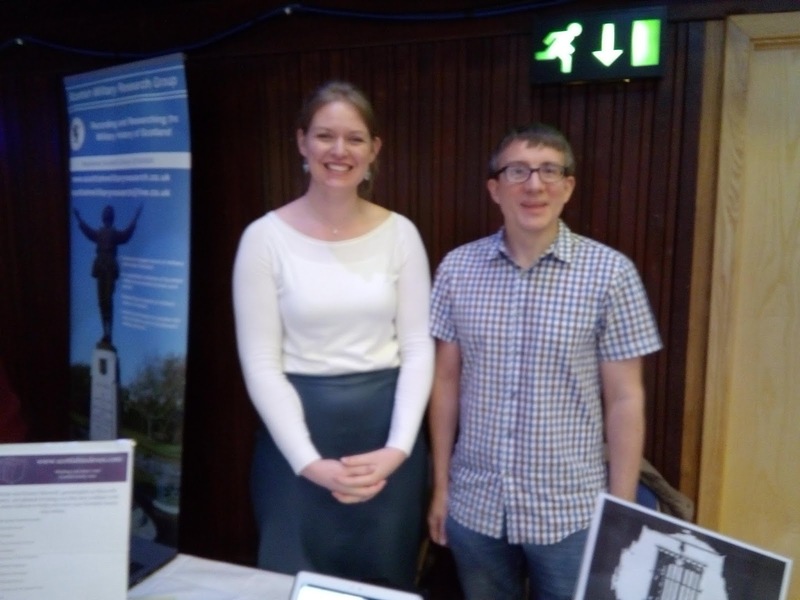 It was also great to see Tony Beardshaw and My History (https://www.my-history.co.uk) present, and copies of my Irish Family History Resources Online book quickly sold out on the stall! I also met Richard and Lorna Conaghan, who are plugging their project Girvan and District Great War Project (https://www.facebook.com/Girvansfallen/). Finally, it was also nice to see the kids of Our Lady & Francis School Choir singing 'Songs that Won the War'. 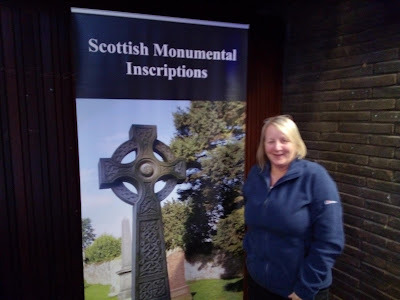 A huge thanks to Lanarkshire Family History Society (www.lanarkshirefhs.org.uk) for another great event - I look forward to returning next year! 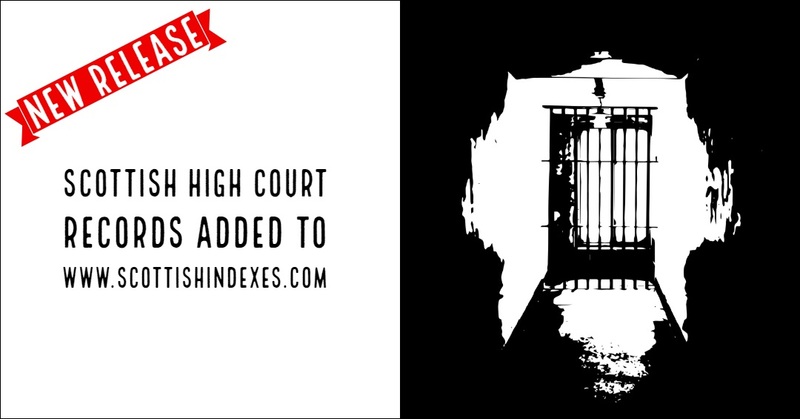 The High Court (officially “The High Court of the Justiciary”) heard a great variety of cases, including all the more serious crimes but also repeat offenders of lesser crimes. In Victorian Scotland, only the High Court had the authority to sentence people to transportation, so if you are looking for Scottish convicts this is the website for you. The surviving records are very detailed and include fascinating witness statements and descriptions of the crimes. Scottish Indexes is a genealogy and historical records website, providing free high-quality indexes to over 700,000 historical records, from paternity records to criminal records, property records and health records. The ever-expanding Learning Zone has easy to follow guides to help you trace your Scottish ancestors in a variety of records, both online and offline. The British Newspaper Archive (www.britishnewspaperarchive.co.uk) has now passed 28 million records. 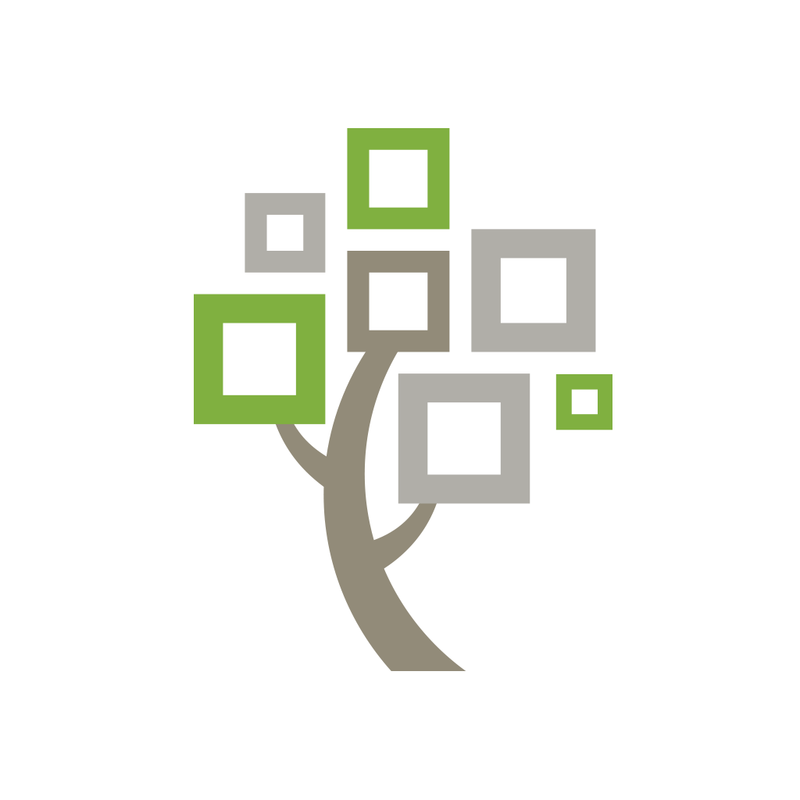 Locate family members making a journey together using TheGenealogist’s SmartSearch. This unique system is able to recognise family members together on the same trip. In this situation it will display a family icon which allows you to view the entire family with one click. 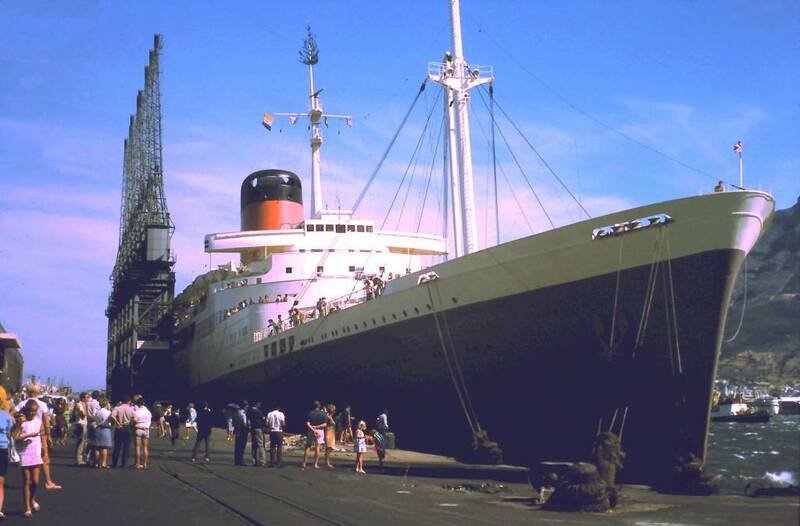 Discover people sailing to the USA, Canada, India, Hong Kong, New Zealand, Australia and elsewhere in the Outgoing Passenger Lists from the United Kingdom. Discover the ages, occupations and address and where the passenger intended to make their permanent residence. We are just 8 days away from an exciting weekend in Oslo and I have good news to share with you. We are making the final arrangements to live stream the genealogy and DNA tracks online on the MyHeritage LIVE conference website (https://live2018.myheritage.com/), so please tune in from 9:00 a.m. Oslo time on 3 November. If you need help calculating the time difference to your local time zone, you can use https://www.thetimezoneconverter.com/. Make sure to visit the conference website to see the full schedule and tune in at the time of the lecture to watch the live stream. New databases have been added to the members area of thre website for the Ulster Historical Foundation (www.ancestryireland.com). The Ulster Historical Foundation is pleased to announce that the new edition of Researching Scots-Irish Ancestors is now in stock! Priced at just £19.99 (plus P&P) this new edition of Researching Scots-Irish Ancestors is a massively expanded version of the first volume.running to more than 600 pages – more than double the length of the original. 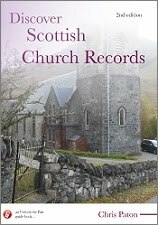 More detailed information is included on the importance of church and land records and new chapters explore the value of records relating to charitable bodies, fraternal organisations and businesses. There is also a discussion of potential sources of information on emigration. A set of parish maps for each county in Ulster has been included and along with a listing of more than 600 places in the province giving the parish location. Whether your ancestors are of English, Scottish or Gaelic Irish background, whether their religious affiliation was Episcopalian, Methodist, Presbyterian, Catholic or other, whether they were farmers, merchants or labourers, this volume will be of enormous value to anyone wishing to find out more about their Ulster roots. This book will be sold locally as Researching Ulster Ancestors (UK & Ireland). 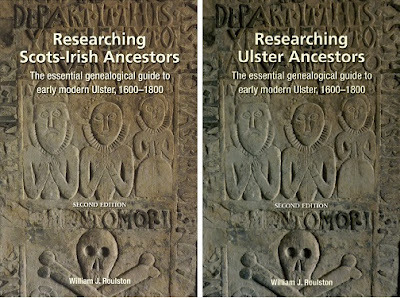 For those of you who might wish to purchase the book under this title visit https://www.booksireland.org.uk/store/all-departments/researching-scots-irish-ancestors-the-essential-genealogical-guide-to-early-modern-ulster-1600-1800-second-edition-duplicate. COMMENT: I've placed an order, and will review the title when it arrives - should be a good read! A further 54 million newly indexed records spanning the years 1921 to 1925 have just been added to our collection of newly indexed England & Wales, Electoral Registers 1920-1932. These new additions mean that the collection now contains a complete run of all surviving records for all parliamentary boroughs from A to L (the first being the PB of Accrington and the last being the PC of Nottinghamshire, Rushcliffe Division). Discover if your ancestor was born in the English county of Dorset. Search more than 387,000 additional records spanning the years 1538 to 1978 and covering more than 300 parishes across the county. A full list of the parishes and date ranges covered by the collection can be found via the useful links & resources section of the search page. Over 22,000 new records have been added to our collection of Dorset burials. The collection spans the years 1538 to 1995 and covers more than 330 parishes across the county. A full list of the parishes and date ranges covered by the collection can be found via the useful links & resources section of the search page. Apologies folks, I don't often delve into politics on this blog, but I have seriously had enough of Brexit. As someone who originally comes from Northern Ireland, I do not want to see the country's progress sacrificed to make way for something it did not vote for, any more than I want to see Scotland fall for the exact same reason (with an even larger Remain vote). I equally do not want to see the future of the Republic of Ireland sacrificed for something it did not even have a vote in, and I am every bit as concerned about what Brexit will do to England and Wales. 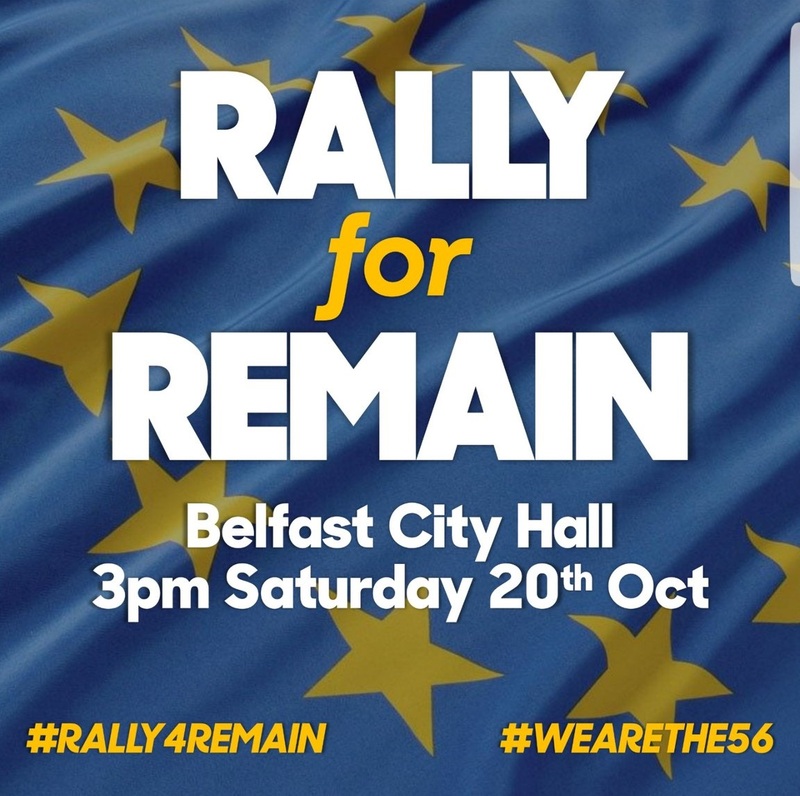 Next Saturday there will be a Rally for Remain at Belfast City Hall at 3pm. 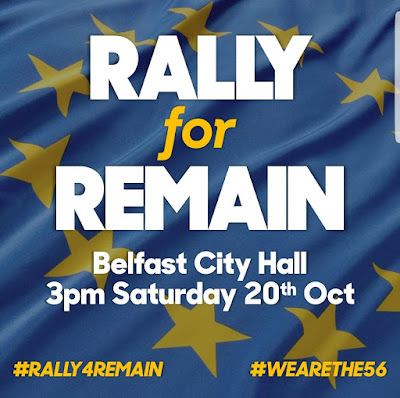 I am intending to travel over (weather permitting) on the ferry from Cairnryan - most likely the 7.30am - to make a morning of it in Belfast, and to then attend the rally in the afternoon, before coming home on the evening boat. If anyone else from Scotland or England is thinking of travelling over, I'd be more than happy to hold an informal genealogy Q&A on board going over and/or coming back, to talk over Irish or Scottish research queries, or even Brexit related issues, such as how to apply for an Irish passport. If you're interested, keep an eye out for me and don't be afraid to come over and have a chat! If you don't agree, no problems, normal service on this blog will soon be resumed! And if like me you are absolutely terrified about what the current Brexit shambles will do to our future prosperity, our peace process and much more, please do get the word out. As some of you may be aware, this last year has seen some very serious challenges within my current domestic situation, that have prompted some changes to my work patterns, including a reduction in blog posting due to time constraints. I'd like to give you all a quick update, however, to reassure you that I haven't gone away, and that I have no intention of doing so! Since January I have been working as a caseworker within the political arena, a job which initially started on a part-time basis but which due to changed circumstances I have been doing full time since late February, i.e. Mondays to Fridays. This has meant a shift in my genealogy services, most notably with client work, which has been reduced somewhat, although not completely, and in the frequency of my blogging, which readers will note is currently not on a daily basis. I will keep blogging as frequently as I can - not least because The GENES Blog is coming close to reaching 6 MILLION page views! Whilst I am still doing some client research, there has been little change to my writing and teaching output. My Pharos courses for Scottish research are still available, with a current Scottish Research Online course at the half way stage just now, and the next Scotland 1750-1850: Beyond the OPRs course kicking off on November 5th (see https://www.pharostutors.com/details.php?coursenumber=302). 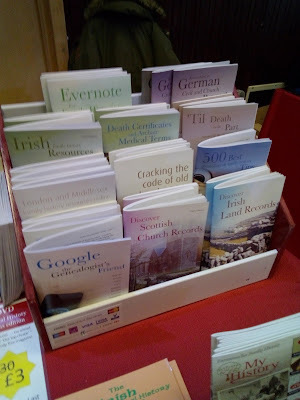 I have also just signed a contract to write a quarterly column for an international magazine on Irish genealogy matters, and am happily beavering away with content for our great publications on this side of the pond, including Family Tree magazine and Who Do You Think You Are? magazine. I'm also looking forward to attending the Lanarkshire Family History Fair on October 27th in Motherwell, to help with the Ask the Experts stall there with the Scottish Genealogy Network, and the next PRONI stakeholder forum in Belfast in early December. But the really exciting development currently under way just now is that I am now working on a second edition of Tracing Your Irish Family History on the Internet for Pen and Sword. The first edition, published in 2013 is one of my proudest achievements, but almost six years on the online Irish genealogical landscape has changed dramatically, and I can't wait to get this new edition out to you also. I also have one or two other things lined up which I cannot discuss just yet, including some forthcoming talks, but things are certainly going to get busier soon! So bear with me folks - I have still a lot to sort through in the next year or so - but I'm hoping normal service will begin to resume again with this blog by the start of next year. For the first time in 2021, people in Scotland will be encouraged to fill out their census questionnaire primarily online, with support and help available for those who need it. ‘Plans for Scotland’s Census 2021’, published by National Records of Scotland, lays out proposals for how the census will be conducted and the questions it will ask. Under the proposals, the census will ask new questions, including whether the respondent is a veteran. It is also proposed that questions on sexual orientation and transgender status and history will be asked. As set out in 2018-19 Programme for Government, a Bill will be introduced this parliamentary session to allow sexual orientation and transgender questions to be asked on a voluntary basis. The report also gives details of what consultation, tests and stakeholder engagement have been conducted to help shape the proposed questions so far. The final proposed questions will be laid before the Scottish Parliament for agreement before the census takes place. “For more than 200 years, Scotland has relied on the census to underpin national and local decision making. The census is the only complete source of whole population information about Scotland. Plans for Scotland’s Census 2021 also include details on privacy and confidentiality, collecting and publishing information and the legislative process. It is being published now to allow sufficient time for discussion of proposed questions and topics. A census is organised in Scotland every 10 years and collects information on households and individuals to inform public services, policy and research. It was possible to complete the census online in 2011, but printed questionnaires were still sent to every house in Scotland. Scotland’s Registrar Generals have taken responsibility for the country’s census since 1861. COMMENT: When the 2011 census took place, I filled it in online and submitted it, but also filled in a paper copy which I held onto, so that my kids could see it in the future, with censuses being closed for 100 years. In fact, I added additional questions, such as what is your favourite football team?, what is your favourite band?, what is your favourite TV programme?, etc! Whatever format the Scottish 2021 census takes (and indeed other censuses in the UK), perhaps think about how you might wish to preserve the information for yourself in an offline format? This is an intermediate level course in Scottish family history for those who are going back beyond 1850. 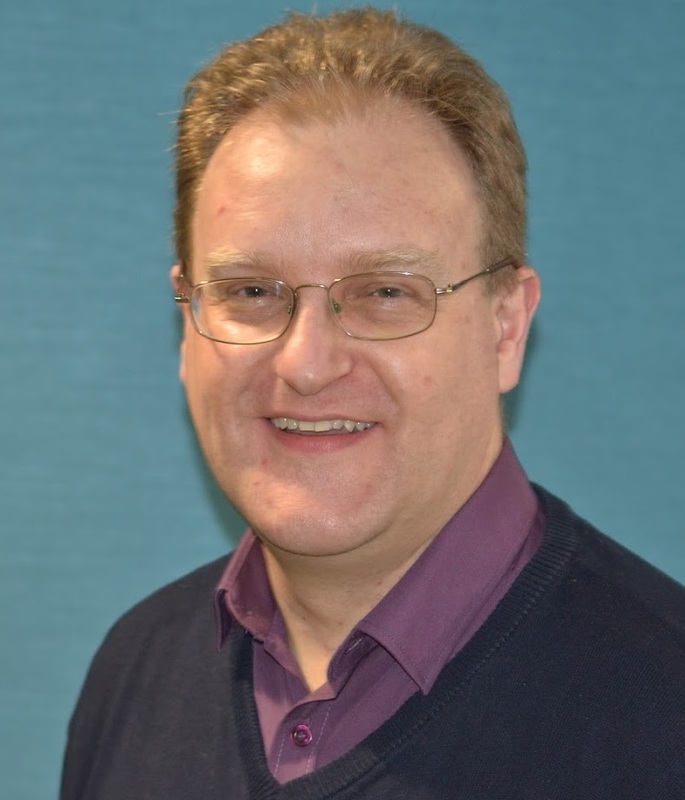 You should have some experience with research in the Old Parochial Registers of the Church of Scotland and in using major websites for Scottish research. This course discusses sources that fill the gap when the OPRs are uninformative or missing; for example, records of parish and town administration, occupations, land transfer and taxation. Using these records involves several different locations. You will learn how to check online finding aids and how to find the most effective way to obtain records that may be online, in print, on CD or microfilm. This is the second course on Scottish research. 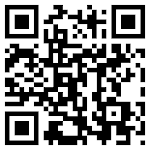 If you have not taken Scottish Research Online please check its description. Each lesson includes exercises and activities; a minimum of 1 one-hour chat session per week. See How the Courses Work. For further details, and to sign up, please visit https://www.pharostutors.com/details.php?coursenumber=302. Missing a certain TV genealogy show? Try this one! Gavin Andrews takes the Laughlins, an Ulster-Scots family, on a personal historical journey back in time to discover what life was like for their ancestors at the turn of the 19th century. Abandoning their comfortable 21st-century lives, mum Kerry, dad Ainsley and daughters Sophie, Anya and Hope find out what it is like to run a small farm with no electricity and a kitchen made up of a table and an open fire. While they struggle with pigs, laundry and fire pots, grandfather Alan begins a genealogical detective trail which eventually leads to a celebrated historical figure. Episode One was shown last week, and you can catch up with it (and future episodes) on the BBC iPlayer - see https://www.bbc.co.uk/iplayer/episode/b0bltvn5/family-footsteps-series-1-episode-1. PRONI, in conjunction with the Antrim and Down Branch of the Western Front Association, hosted a half day conference looking at final year of the First World War in Ireland. This event was held on 13 September 2018. You will also find it online at https://youtu.be/WdqhocD4nyQ. The total video is just under 2 hours and 40 mins long. The Family History Show, London has now released a video of interviews with some of the many happy exhibitors. Comments from the stall holders included just how busy they had been throughout the day and what a friendly environment the venue had been. 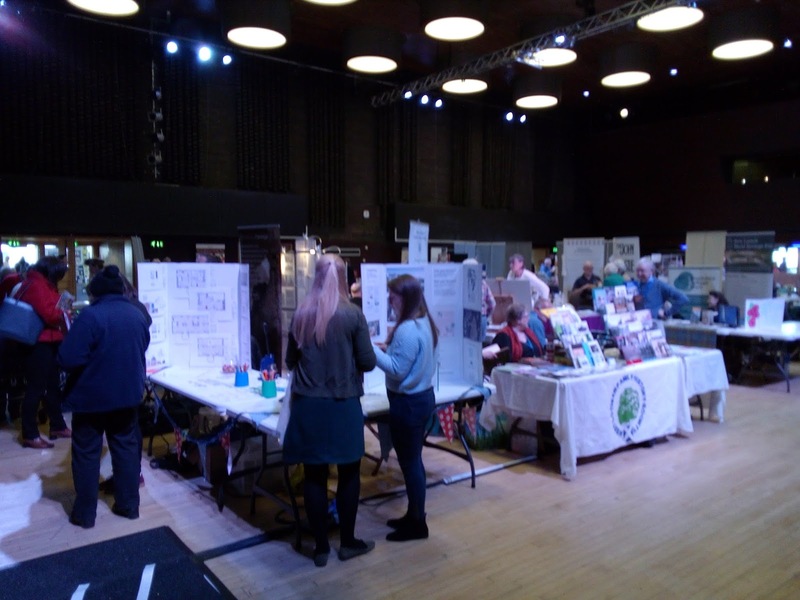 Other exhibitors mentioned what an excellent fair it had been with a good turn out and many interesting stalls that had engaged and impressed those visiting the event. The large crowds of show visitors testified to the public’s willingness to support this event, now double the size from last years show. Perhaps made more popular by its low cost entry, free car parking and free mini-bus to and from the rail station. The various free talks held in the two good sized lecture theatres were well attended throughout the day as was the new free ‘Ask the Experts’ zone. 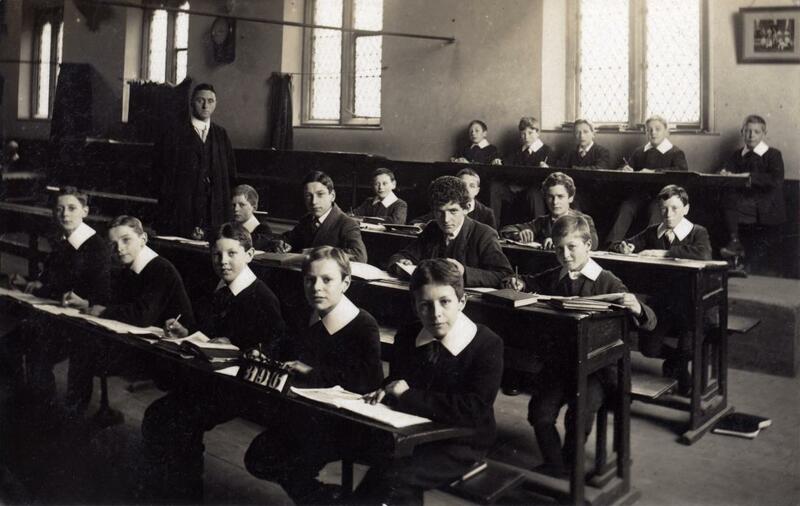 Search for your English ancestors in this index of more than 111,000 poor law union records. This index comprises 16 different types of poor law union documents from 24 different unions across the English county of Kent. It was created from original records held by the Kent History and Library Centre. Over 8,000 new articles from more than 60 publications are now available to search. The new additions cover The UK, Ireland, The United States, Canada, New Zealand, Australia and Slovakia. Library Search is a new National Library of Scotland service which will replace the main catalogue and provide wider access to our collections. It will bring together, in a single search, details of our printed, manuscript and archive, moving image and digital collections, as well as high quality e-resources and databases from a range of publishers. Library Search is scheduled to be in place by November 2018. Millions of records and abstracts from online services, digital archives and databases. TheGenealogist launches more school registers into its Educational Records adding tens of thousands of additional individuals. * Give details of their later occupation etc. Scotland’s largest Local and Family History Show will be taking place this year on Saturday 27th October in Motherwell Concert Hall. Family history societies from across Scotland will be attending, alongside national and local heritage organisations. Local museums and attractions will include Summerlee Museum of Scottish Industrial Life, New Lanark Mill and Friends of Low Parks Museum. A large number of organisations involved in local history, archives and heritage will be taking part, including North Lanarkshire Archives (with historic NHS material from Hartwood Hospital), Motherwell Heritage Centre, Lanarkshire Yeomanry Group, and local heritage groups from Shotts, Carluke and Crawfordjohn. 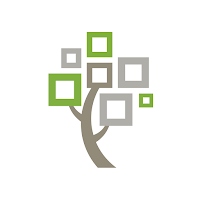 Genealogy supplies companies My-History and Treehouse Genealogy & Gifts will have everything that’s needed to keep your research in order. The Scottish Genealogy Society, Historic Environment Scotland Archives, Scottish Indexes, the Guild of One-Name Studies, Scottish Monumental Inscriptions, Scottish Catholic Historical Association, and the Scottish Military Research Group will all be present, along with publishers of history-themed books. 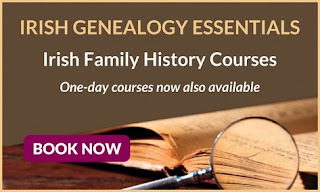 Professional genealogists from the Scottish Genealogy Network will join members of Lanarkshire FHS in the ‘Ask the Experts’ area to offer free one-to-one advice to anyone who’s hit a brick wall in their research or wants assistance to plant or grow their family tree. Specialist help on Irish and military research will be available. Information about tickets and an up-to-date list of exhibitors can be found on the Show website http://lfhsshow.weebly.com/ Entry costs £2 per person, with talks priced at £3 each or £10 for all four. Children under 12 are admitted free with a paying adult. There’s good public transport, free parking, disabled access and facilities.